A finite difference scheme is introduced to solve the D-bar equation. The D-bar equation arises in electrical impedance tomography (EIT) when using the complex geometrical optics solutions to recover the conductivity within a body. This scheme is second-order and is first used on a test equation for error analysis and then used to reconstruct EIT images using the D-bar method. Muller, Peter, Isaacson, David, Newell, Jonathan, & Saulnier, Gary. (2014). 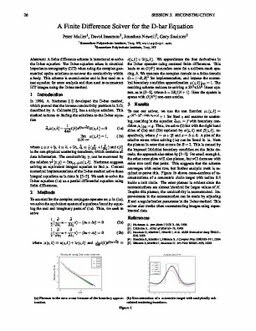 A Finite Difference Solver for the D-bar Equation. In 15th International Conference on Biomedical Applications of Electrical Impedance Tomography (EIT 2014). International Steering Committee on Electrical Impedance Tomography.